Unless you have verifying / reproducible - objective data, It's generally considered anecdotal and opinion. I haven't bothered to look at your original thread, but I think it's important that users that don't have the technical equipment or knowledge to give good opinion and anecdotal experiences and let the people who do have said equipment and process to validate your opinion or experiences. There's a thread where i questioned the validity of some gross testing because of human reaction time at such high refresh rates do in fact play a role on the data obtained. While I understand the frustration in how people may approach your insights, it is only natural to be skeptical and look for hard evidence in a site like this, no? phatty wrote: Unless you have verifying / reproducible - objective data, It's generally considered anecdotal and opinion. There is evidence and objective data. 240hz monitors have like 8ms to 12ms pixel response time at 240hz, while the best 144hz matured monitors have 5ms to 7ms pixel response time at 144hz. Keep in mind the difference in refresh rate and you will see how odd that is. All the data is on Rtings reviews, probably the most professional and best panel reviews website right now due to the tools they use. And as I said, is normal that some people dismiss our "opinions" (wich we know are facts because we tested a ton of these things), because we don´t have tools to give you numbers, like you said. Just like yehaw I tried almost 10 different models and they all had the same problems, and 240hz still delivers me a blurrier experience than a good 144hz monitor. Yes the input lag is decreased and noticeable, but pixel response time, altho not as important as input lag on shooters, is still very important. Some people even use strobing on competitive play, wich adds double input lag numbers, and they prefer to have higher input lag , but better motion clarity to land those shots. So now imagine having ultra low input lag, but having to deal with a pixel response time almost as high as some 75hz monitors. Something is wrong when you play on a good 144hz panel and have a great pixel response time, with really low ghosting, and then switch to 240hz, enjoy the reduced lag on the mouse, but have to deal with higher ghosting? It just puzzles you and destroys your experience once you got used to a proper pixel overdrive implementation. When we have 240hz Oled or MicroLed, or 240hz TN with 0,5ms rated response time GtG then maybe things change. All the manufacters seem to forgot that at 240hz we need ultra fast panels. Or I mean, they know that, but the 240hz marketing is strong, so they make money from poor panels, but they are 240hz, so a lot of uninformed people like me and yehaw went All-In with these models thinking they would be the holy grail of a responsive gaming experience. I also learnt by myself that IPS 144hz panels aren´t simply competitive, even if some people swear they have no ghosting etc. Now more and more people admit IPS is not suited for first person shooters. I would never ever buy one again, they are crap, reminds me of first gen LCDs that would give a huge trail behind every fast moving object. Disgusting. Total waste of money! Just like 240hz seem to be waste of money unless you play certain games or want certain scenarios where the absolute minimum input lag will make the difference. yehaw wrote: So you can see why I'm pissed the way the staff handled the situation. I saw these things early on, nearly everyone in my thread dismissed what I was seeing and tried to debunk my findings as an "opinion". The Chief (admin), as far as I could see, was basically Switzerland in most if not all his posts (and, at the very worst, derivative of the original subject), and RealNC (moderator) echoed pretty much what I said in his (only) post, suggesting the panels generally weren't ready for primetime in this regard. The only posters who got even close to hostile were non-admins/moderators. While I have moderator privileges, I personally limit my use of them to eliminating pure spam posts/users on the forum. I'm not sure about the Chief's or RealNC's stances, but I doubt they make a general practice of deleting posts containing opposing opinions to the OP, so I'm not sure how they (whoever "they" were in this case) could have "handled" anything any better in that regard. As for you taking issue with your thread being partially re-titled to "opinion," I'm not sure why that's so unconscionable to you. Some of these 240Hz monitors have better overdrive implementation than other 240Hz monitors, even with the same panel (and you yourself said you only saw two in person, at least at the time), and just because you are right to say that most of these 240Hz monitors have more overdrive issues than 165Hz or lower panels (as they can't reach the GtG necessary to keep up with the refresh rate), doesn't mean the actual perception of this flaw is objectively appreciable to all users exposed to it in real-life use; some may not notice, some may not care. So, in that context, it is subjective. But yes, again, overdrive on these 1st gen 240Hz panels aren't able to keep up. That said, the best of these 240Hz panels may have worse overdrive artifacts, but the 240Hz refresh rate itself (at least on the better models) still resolves more detail at 240 FPS. Is the overdrive worse on the 240Hz model than it is on the 165Hz model? Undeniably, yes (note the purple corona, for one). Is the actual resolved detail worse on the 240Hz model than it is on the 165Hz model? No, 240 FPS @240Hz, even with poorer overdrive, further solidifies details, such as the UFO operator's control stick. Bottom-line, is if you're extremely sensitive to overdrive artifacts, then I think we've established (perhaps even beaten into the ground by now) that you probably aren't going to be happy with a 1st gen 240Hz panel, and you're objectively, factually correct about this specific point from what we can gather thus far on the examples available to us. That said, this doesn't mean this is a deal breaker for everyone, and the best of these 240Hz monitors, regardless of overdrive performance, do in fact resolve more detail at max FPS/refresh than lower refresh rate monitors do, thus: ultimately subjective, thus: ultimately opinion-based on whether they're worth purchasing over a lower refresh rate gaming monitor. I switch backed to my AOC 165hz (oc) and for some reason, I notice 165hz at any fps looked smoother than the 240hz panel! The only time the Alienware looked better, is when it's above 200fps! I do some more tests. I play Doom(2016 version) at 165hz on the AOC, 240hz on the Alienware. I can only push about 80-110 fps in this game. On the AOC, I run it downscaled at 1080p and play 30 minutes with no issues. Switch to the Alienware, after 15 minutes of playing, eyes start to feel heavy and like they're going to pop out of my head! After a bit, I can feel my eyes strain with every fast swipe. Even settings the overdrive higher, it helps a little, but this is a huge flaw. Or normal overdrive, I start to feel sick. The slower response times/worse overdrive were the cause of my eye strain in that last paragraph. My eyes grew accustom to faster response times/better overdrive/or whatever the issue is, then my first 240hz I see this awful smearing, so my eyes were strained, as they were accustom to seeing less blur and sharper details to objects in motion. Just like I get headaches and eye strain from games that use software motion blur. jorimt wrote: Is the overdrive worse on the 240Hz model than it is on the 165Hz model? Undeniably, yes (note the purple corona, for one). Is the actual resolved detail worse on the 240Hz model than it is on the 165Hz model? 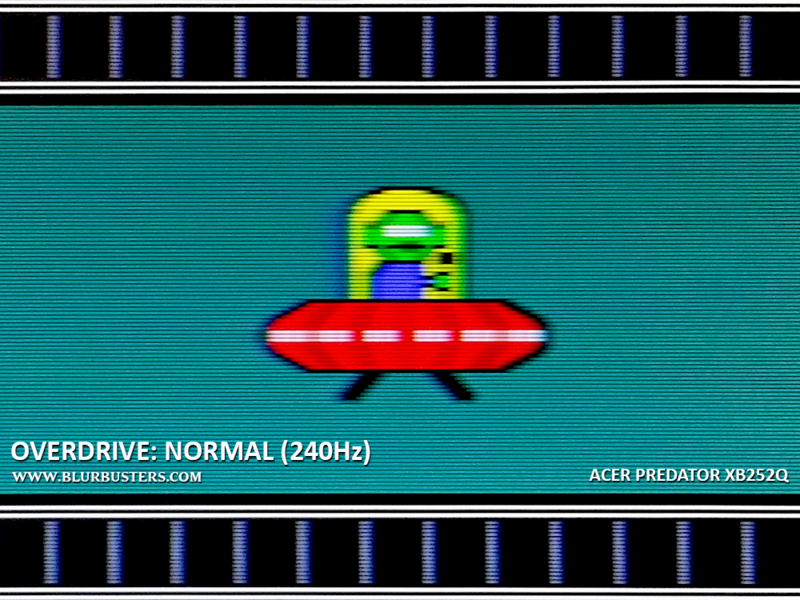 No, 240 FPS @240Hz, even with poorer overdrive, further solidifies details, such as the UFO operator's control stick. Again, I said the problem is only at lower frame rates, it was stated in my original post. And you're posting an image @ 240hz/240fps, which was never my problem with the panels. And clearly your camera equipment is better than what I have, so it's going to look better than what I posted. This topic was so long ago, that I don't remember exactly who was arguing against my points and that's not fair on my part to blame the admins, so I apologize. I should have gone back and read the thread over before placing the blame on the admins. As far as deleting things, I don't think I ever accused anyone of deleting anything, or maybe I'm misinterpreting this part. I was just upset my thread was renamed as an opinion. And I still stand by what I said, the panels are blurrier at lower fps and it's not an opinion if it can be tested and proven correct or incorrect. Sure it can be subjective, maybe someone has worse eye sight, maybe someone never plays outside of 240fps, etc - but if it's tested, you will have fact or myth, not opinion. The panels I had will come back looking blurrier than the best 144hz at lower frame rates, I will guarantee it comes back as fact. So blurbuster admins, why not start a Mythbusters segment and put it to the test with some of the monitors mentioned where people see these issues? I think it would be a fun thing to do. And to finish, there are some people saying, get the right tool for the job, think this is acceptable, etc - but I saw the blurring even watching sports streams, which I mentioned in my original thread. Basketball and football were the worse, I could see is stand out so badly anytime a pass was thrown and the camera had to pan quickly. So it affected even outside of gaming. There should be no excuses for a $500 premium product at the time. If I paying that much, I expect a superior experience to 144hz, not a worse one. yehaw wrote: There should be no excuses for a $500 premium product at the time. If I paying that much, I expect a superior experience to 144hz, not a worse one. This! Spot on. The problem is that we are paying high money for superior experience/quality only at 220fps-240fps @ 240hz. And that´s an unrealistic target for most usage scenarios when you have a monitor, unless your whole time is spent around counter strike or overwatch. And let´s not forget what I also said on the first post, about the fact 240hz didn´t make my aim any better, and if it did it was by 5%. I even got worse results on Aim Hero simulation scenario using 240hz vs 144hz (margin of error I guess). Let me assure that if I compare my results at 60hz vs 144hz the difference will be huge. Hi. I have xl2411z, I like it, the game features (blur reduction, AMA) work. But I want to buy xg248q for a new experience and for playing overwatch. It's worth it? yehaw wrote: That was my entire dang point to the thread I created, that 240hz are blurry mess if you can't hold an extremely high frame rate! I even said 240hz looks better when it's above 200fps! I didn't say it wasn't your point. I was just making my own (and, to be fair here, I in fact acknowledged yours in the very portion you quoted). yehaw wrote: The slower response times/worse overdrive were the cause of my eye strain in that last paragraph. My eyes grew accustom to faster response times/better overdrive/or whatever the issue is, then my first 240hz I see this awful smearing, so my eyes were strained, as they were accustom to seeing less blur and sharper details to objects in motion. Just like I get headaches and eye strain from games that use software motion blur. Yes, worse overdrive implementation, aware. It can be seen in the pursuit photos, though the actual resolved detail between the two (165 FPS/165Hz and 165 FPS/240Hz), barring pursuit tracking differences in your comparison, looks about the same. You never mentioned, but was that 165 FPS @240Hz scenario on the 240Hz monitor 165 FPS @240Hz, 165 FPS (fixed) @165Hz, or 165 FPS G-SYNC @240Hz? I don't recall if the monitors in question have G-SYNC or not, but it would be interesting to know whether G-SYNC could help with this overdrive issue at lower refresh rates with it's variable overdrive function. I no longer have my 240Hz test monitor, so I can't check this myself. yehaw wrote: clearly your camera equipment is better than what I have, so it's going to look better than what I posted. I captured that on a Samsung Galaxy Note 3, actually. It's just a pain to get that accurate of tracking. yehaw wrote: This topic was so long ago, that I don't remember exactly who was arguing against my points and that's not fair on my part to blame the admins, so I apologize. I should have gone back and read the thread over before placing the blame on the admins. As far as deleting things, I don't think I ever accused anyone of deleting anything, or maybe I'm misinterpreting this part. I was just saying that you probably mistakenly attributed some of the more hostile posts to the admin/moderators, when they were, in fact, user posts, and in that specific case, you can't expect the mods to "handle" it any better, unless they blot out other users dissenting opinions, for instance. yehaw wrote: I was just upset my thread was renamed as an opinion. Head, meet wall. I'll just let you have that one. I wasn't involved in that decision, so I can't really to speak any more to this point. yehaw wrote: So blurbuster admins, why not start a Mythbusters segment and put it to the test with some of the monitors mentioned where people see these issues? I think it would be a fun thing to do. I, for one, am not (regularly) paid staff. I do most of this (including all forum participation/moderation) on a volunteer basis. So that would be up to the Chief if he wanted to invest the time and expense into something like that. The excuse is, while the 1st gen panels are physically capable of increased raw motion clarity at 240 FPS/240Hz (what they ultimately promise and deliver on), they are physically incapable of reaching the GtG transitions necessary to have the same static overdrive quality that some lower refresh rate panels have, and if said lower refresh rate panels were pushed to 240Hz, they would have the same (if not worse) overdrive tuning limitations at that refresh rate as well. Early tech + early adoption = risk. It happens with literally every technology. It's the reason I personally wait at least a couple of gens before purchasing anything. Yes, but it's sort of validation for me now that I wasn't just making things up and wasn't just an opinion, it's a limitation of the technology. jorimt wrote: You never mentioned, but was that 165 FPS @240Hz scenario on the 240Hz monitor 165 FPS @240Hz, 165 FPS (fixed) @165Hz, or 165 FPS G-SYNC @240Hz? I don't recall if the monitors in question have G-SYNC or not, but it would be interesting to know whether G-SYNC could help with this overdrive issue at lower refresh rates with it's variable overdrive function. I no longer have my 240Hz test monitor, so I can't check this myself. I wish I could recall for that specific test, but I can't remember. What I do remember though, was trying it with G-Sync on/off for extended gaming sessions and I still developed strained eyes after a while and could see the same blurring, so I don't think it helped much at improving, or at least to where my eyes could see a difference in the blurring. And the rest of the other 240hz panels I've tried were all FreeSync, so I can't give feedback on the VRR for those, as I have an NVIDIA gpu (was before the FreeSync update w/ NVIDIA). jorimt wrote: I was just saying that you probably mistakenly attributed some of the more hostile posts to the admin/moderators, when they were, in fact, user posts, and in that specific case, you can't expect the mods to "handle" it any better, unless they blot out other users dissenting opinions, for instance. You're absolutely right and I'll apologize again. Going back to read the thread and trying to be subjective while doing so, I can see why the thread was closed, as it was just lots of back and forth bickering, despite Chief trying to calm things down a few times. jorimt wrote: Early tech + early adoption = risk. It happens with literally every technology. It's the reason I personally wait at least a couple of gens before purchasing anything. I completely agree. I mentioned in my thread, you're essentially paying to beta beta test 240hz and it needs time to mature. yehaw wrote: I wish I could recall for that specific test, but I can't remember. What I do remember though, was trying it with G-Sync on/off for extended gaming sessions and I still developed strained eyes after a while and could see the same blurring, so I don't think it helped much at improving, or at least to where my eyes could see a difference in the blurring. And the rest of the other 240hz panels I've tried were all FreeSync, so I can't give feedback on the VRR for those, as I have an NVIDIA gpu (was before the FreeSync update w/ NVIDIA). Hm, yeah, only G-SYNC monitors w/modules use variable overdrive (99% of FreeSync monitors do not), so FreeSync may have just exasperated this overdrive limitation at 240Hz w/lower framerates anyway. As far as I'm aware, overdrive presets are tuned to the max refresh rate of the monitor, and are fixed at those parameters, regardless of framerate during non-VRR operation. And, at best, even G-SYNC would probably only be using the fixed 240Hz overdrive preset(s) as a base to make it's adjustments at lower framerates/refresh rates, which means the overdrive during VRR would only look as good as it does at max Hz. What I am interested in knowing specifically with these 240Hz monitors, is if any of them have separate overdrive parameters at lower fixed refresh rates that visibly adhere closer to the overdrive performance of the native <165Hz panels. For instance, if you take a 240Hz monitor, set it to a physical 144Hz maximum in the control panel and do motion tests, is it using the same internal overdrive preset parameters at a physical 144Hz scanout (6.9ms) as it is at a physical 240Hz scanout (4.2ms)? I'm assuming it is, since monitor manufacturers don't expect someone who buys a 240Hz panel to underclock it to 144Hz right off the bat, but (while I'm assuming some reviewers have probably tested this very scenario) it would be interesting to confirm. @Notty_PT, have you ever tried this specific scenario? How did you capture it? I mean I want to test my monitor as well. Did you just record a video without any setting?